Hi everyone! We’re so excited to be back this week with an amazing (and huge) group of puppies! With a record number of pups ready in one week (we think the Mommas were plotting eight weeks ago, just to see us run ragged on this new puppy day!) we have been incredibly busy over the last two days getting them all settled in, but overwhelmed with kisses and sweet personalities which we’ll never complain about! 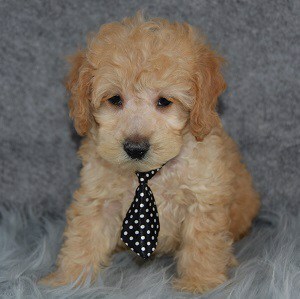 All these new puppies are so charming and can’t wait to meet their forever families. You’re welcome to visit them anytime and we’re open seven days a week, no appointment needed! We’re going to get right to it since there are so many pups to introduce! Enjoy! This week Ridgewood welcomes Stevie, Mason, Maisie, River, Canyon, Forest, Meadow, Cupid, Katia, Katinka, Anna, Grace, Shaw, Shay, Amour, Tayri, Pendo, Love, Laska, William, Brinley, Brienne, McTavish, McLellan, McFadden, McAllister & McKella! First up for this week we have the sweet and silly Stevie! This funny little man is the first of several Shichons this week, and is sure to win the heart of everyone he meets. Stevie lives to entertain humans with silly antics in the play area, kisses and cozy snuggles. You can actually see the joy on his face when his people are happy! Stevie can’t wait to start his life with you, so come in and see if it’s meant to be today! Up next we have Mason and Maisie, two of the most charming little Yorkies! These two silly pups are so entertaining during playtime and love to play with children. Yorkies do well with training and make great companion dogs. These two pups love people and are always up for making new friends. They are great at quiet playtime by themselves with their favorite toy and are so well behaved. They’d love to start bonding and getting to know the world with you as soon as possible, so stop in today to make one of these cuties yours! Many of you have been waiting for this next breed! Cockapoos!! These are four of the sweetest pups and they love people so much. Half Cocker Spaniel, half Toy Poodle, River, Canyon, Forest and Meadow are full of fun, know how to have a good time and love with their whole hearts! Cockapoos are wonderful with children and are great for quiet families, or families who are always on the go and want to take their pup along. These four will certainly love going on adventures and quality time snuggling up with their forever families! Stop in anytime for a visit with these cuties, or reserve one online today! Of course, Valentine’s Day is just around the corner, and here comes Cupid to steal your heart! 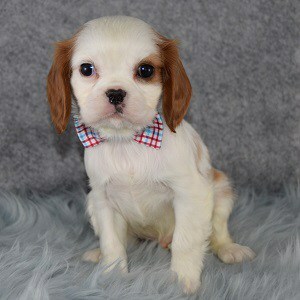 This adorable little boy is a purebred Cavalier King Charles Spaniel and could not be anymore sweet. True to his breed, Cupid is full of charm and spirit. He loves making new friends and plays so well with children and other puppies. Cavaliers are very loyal to their owners and train very easily. They are very loving and life is never dull with a cheerful Cavalier around! Cupid can’t wait to capture your heart, so stop in and give him the chance today! Katia and Katinka are up next, and if you are looking for an oh-so cute, darling of a puppy, these little girls are just for you! These sisters are Shichon puppies, half Shih Tzu and half Bichon Frise and could not be anymore sweet. They are great candidates if you’re looking for a companion dog who will always want to be by your side. Katia and Katinka are so excited to start a lifetime of cuddling and bonding so don’t miss out! 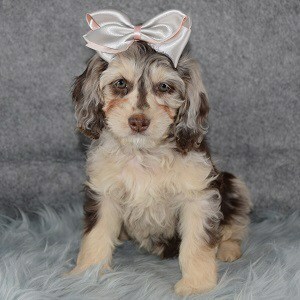 Call today to reserve one of these beautiful girls! 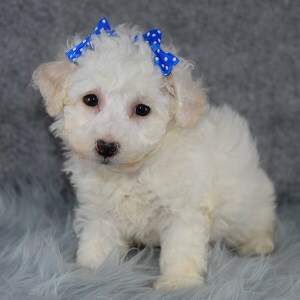 Now we have Anna, a very sweet Bichonpoo puppy! Sweet really doesn’t even describe this little girl. She just has this gentle, kind way about her and is so patient and graceful in her approach to making humans fall for her. She’ll sit near you, just out of reach and watch you patiently, then scoot a bit closer, and a bit closer…almost as if you’re a beautiful skiddish creature she is afraid might run from her and she most know you and snuggle you! We’ve never met a puppy quite like Anna before and we’re all absolutely in love. 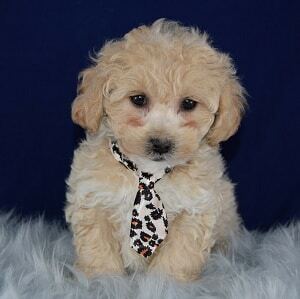 Don’t wait to make this darling little puppy yours! Stop in for a visit with her today! From one special pup to another! 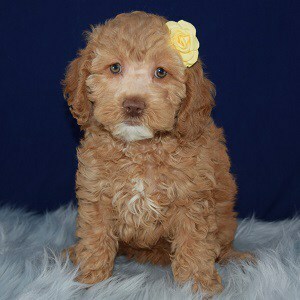 There is just something about Grace the Cockapoo! This rare, gorgeous girl is not only unique in coloring, but in personality too! She is a definite free spirit…loves playtime and is such a ham while she’s doing it. Dances like no one is watching so to speak! And while she is feisty and full of life, she is sooooo well behaved. She’s almost human like in her interactions with us and always seems to know just what we want from her. When we speak to her, she sits and listens, hanging on our every word. Training is sure to go very well with this beautiful girl and we are jealous of whoever gets to spend her whole life with her! Give us a call today to make sure it’s you! And now we have two beautiful Schnoodles!! 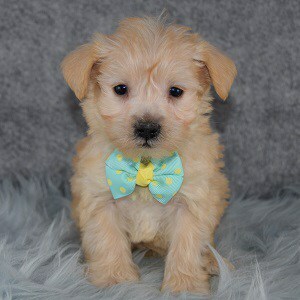 We know many of you have been waiting for this breed, and these are two of the smallest, sweetest Schnoodles we’ve ever had! Shaw and Shay are two very quiet, cuddly babies and can’t wait to find forever families who will spoil them and treat them like the prince and princess they are! 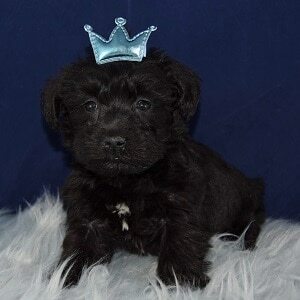 They are half Schnauzer, half Toy Poodle and will make very loyal, loving pets for whoever they end up with. Shaw and Shay are eagerly awaiting their forever families and hope it will be you! 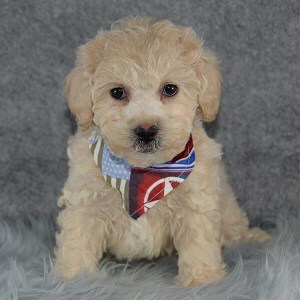 Stop in or give us a call to reserve one of these pups for your family! Now we have another beautiful litter of Shichon puppies! With the love and sweetness you get from this these pups, and Valentine’s coming, we had to give them names that all mean love! Amour, Tayri, Pendo, Love and Laska are five very silly, very charming pups who love to have a good time and love to make people fall in love with them! 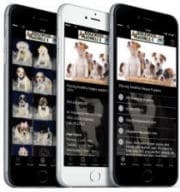 Shichons are wonderful for first time pet owners and families with children. They do not shed and get along great with other pets. Visit these cuties anytime, or call to make one yours today! Oh, Sweet William! 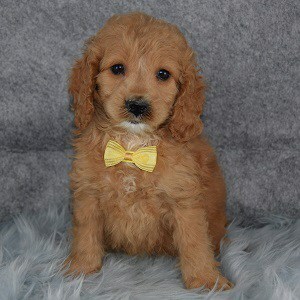 This gorgeous Poodle pup is such a little lover and is all about cheer and happiness! 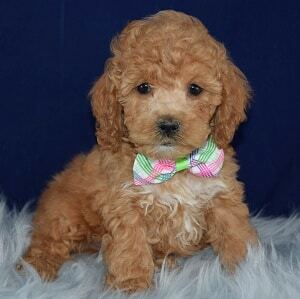 Poodles are a great choice if you have any allergies in your family. They’re among the top three breeds for being hypo allergenic. They are also very smart and William lives to please and make people happy! This little boy can’t wait to start a fun filled life with you, so stop in and fall in love with him today! We have two very tiny, dainty Cavistons up next! Probably our smallest of this breed ever! 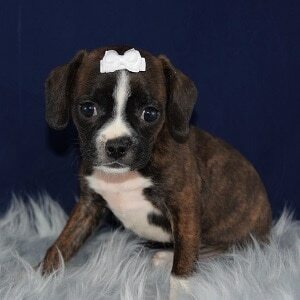 Brinley and Brienne join their siblings Brighton, Britta and Briony in the hopes of finding forever homes this week! These two little girls are so petite and will make such great companion dogs. They love to just sit quietly with us while we go about our business and keep us company. 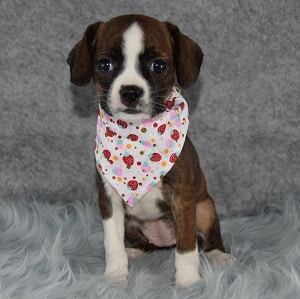 They are half Cavalier King Charles Spaniel, half Boston Terrier and are so friendly with children and other puppies. They can’t wait to find families to become a part of, so visit anytime, or reserve one of these sweet girls online! What a whirlwind! We’re at our last litter of pups though! 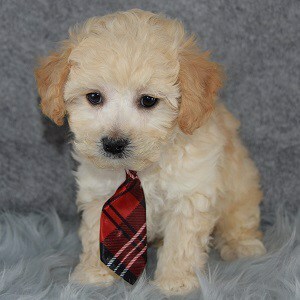 McTavish, McLellan, McFadden, McAllister and McKella are five very happy-go-lucky puppies and can’t wait to meet you! 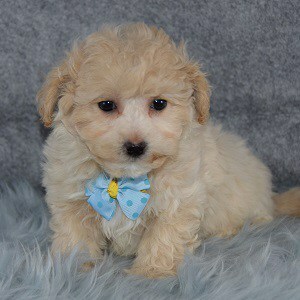 These pups are Bichonpoos, half Bichon Frise, half Toy Poodle and are another great breed for people who have allergies! They are so fun loving and are sure to add all kinds of happiness to their forever families. If you’re looking for a non shedding puppy, who is great with children and eager to be a part of your family, stop in and make one of these adorable pups yours today! Thank you so much for checking out all the new puppies! We’re so happy this big bunch is with us and can’t wait to share them all with you! Stop in for a visit anytime, or give us a call if you see someone you’re interested in! See you back here next week!